Durango is a state of northern Mexico directly to the south of the state of Chihuahua. In 2005 the population was 1,509,117. The climate is generally dry and healthful and the rainfall very light in the eastern part. There are no rivers of any size in the state. The principal industry of the state in the mid-20th century was mining, although extensive cattle ranges are found on the higher elevations. The capital city is Durango, which is located in the picturesque Guadiana Valley about 6,200 feet above sea level. It is an important mining and commercial center and is famous for the great mountain of iron that lies northwest of the city. Its manufacturing establishments include cotton and woolen mills, glass works, iron foundries, tanneries, flour mills, sugar refineries, and tobacco factories. It was founded in 1563. An Old Colony Mennonite settlement is located about 75 miles northwest of the city of Durango. It had a population of about 3,000 in the 1950s. Fretz, J. Winfield. "Durango (Mexico)." Global Anabaptist Mennonite Encyclopedia Online. August 2008. Web. 24 Apr 2019. http://gameo.org/index.php?title=Durango_(Mexico)&oldid=94448. Fretz, J. Winfield. (August 2008). Durango (Mexico). Global Anabaptist Mennonite Encyclopedia Online. 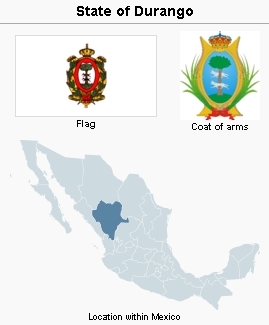 Retrieved 24 April 2019, from http://gameo.org/index.php?title=Durango_(Mexico)&oldid=94448. Adapted by permission of Herald Press, Harrisonburg, Virginia, from Mennonite Encyclopedia, Vol. 2, p. 109. All rights reserved.